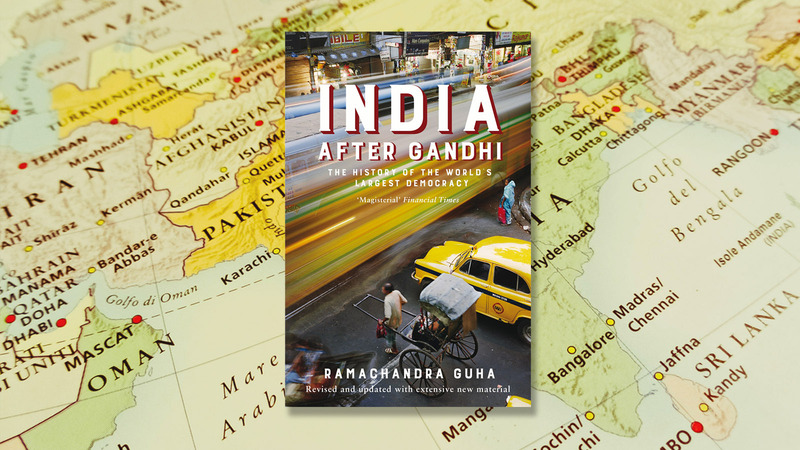 Ten years since the publication of his seminal book, India After Gandhi, Ramachandra Guha reflects on the changes the country that have occured in the country in the past decade. On 15th August 1947, after a nationalist struggle that lasted three decades, colonial India divided and became two nations - modern India and Pakistan. Seventy years on, India is home to over one billion people, the largest, most vibrant democracy in the world. A decade after the publication of his book, India After Gandhi, the most comprehensive biography ever written of the modern nation, historian and cultural commentator Ramachandra Guha discusses: is India becoming more or less democratic as time goes on? India after Gandhi was first published in 2007, on the sixtieth anniversary of the country’s independence. In the book, I described India as a ‘fifty-fifty’ democracy. By this I did not mean that exactly 50% of India was democratic, while exactly 50% was not. Rather, the phrase (borrowed from a line uttered by the Bollywood comic actor Johnny Walker) was meant to signify that, despite the regular holding of free elections, there remained deep deficiencies in the functioning of public institutions. The courts, the civil services, the police, the schools and hospitals, even India’s Parliament, were shot through with inefficiency and corruption. Ten years later India after Gandhi appears in a new, updated, edition, to mark the seventieth anniversary of the country’s independence. How has India progressed in the past decade? Has it become more democratic, or less? India is a large, massively populated, and staggeringly diverse country. The questions posed in the preceding paragraph can scarcely be answered in a straightforward or unambiguous manner. This essay, therefore, adopts a disaggregated approach, by focusing in turn on politics, society, and economics. In the past decade, the health of India’s political democracy has slipped further. Elections are still free and fair, but the cost of contesting them has gone up enormously. There is no level playing field; rather, the candidate or party with the most money usually has the best chance of winning. A large proportion of legislators both in provincial assemblies and in the national parliament have criminal records. In 2017, as in 2007, the police in India is corrupt and occasionally brutal. State-run schools and hospitals are largely dysfunctional. Political interference has further undermined colleges and universities, and even reached India’s Central Bank, which was not even consulted before high-denomination currency notes were withdrawn before a crucial election. The courts in India are overburdened, and judges prone to sensationalism and over-reach. The Income Tax Department and the Central Bureau of Investigation increasingly serve as instruments of the ruling party. India’s democracy is further weakened by the growth of authoritarian tendencies among the political class. The Congress Party has long been run by a single family. So are some regional parties, while others are run by a single individual. More alarmingly, what is now India’s dominant (and sole national) party, the Bharatiya Janata Party, has seen the rapid whittling down of inner-party democracy. Two individuals closely control the BJP’s workings, with Prime Minister Narendra Modi and Party President Amit Shah being to their party now what Indira Gandhi and Sanjay Gandhi were to the Congress in the 1970s. The rise of authoritarian leaders has led to increasing attacks on the press, at the Centre as well as in the States. While independent journalists are harassed and intimidated, reporters and anchors who support the ruling party or its politicians are encouraged and even funded. Meanwhile, the resources of the state are misused to promote the Cult of the Great Leader (Narendra Modi) through advertising campaigns conducted at the expense of the taxpayer. When judged from the lens of politics and public institutions, Indian democracy is distinctly sub-optimal. Political parties, the press, schools, hospitals, courts and law enforcement agencies, compare poorly with similar institutions in Western Europe or North America. Indeed, they probably function worse now than they did ten or twenty years ago. The French anthropologist Louis Dumont famously described Indians (and Hindus in particular) as ‘Homo Hierarchicus’. The characterization was not unfair. For the caste system is the most sophisticated, as well as the most diabolical, system of social exclusion and discrimination ever invented by humans. Notably, Indians have discriminated as harshly on lines of gender as of caste, with both Hinduism and Islam elevating men to a position of permanent superiority over women. By advocating the abolition of Untouchability, and according women the same rights as men, the Indian Constitution radically challenged these twin axes of social discrimination. In the six-and-a-half decades since the Constitution was adopted, the progress towards caste and gender equality has been slow and halting, but by no means invisible. In the past decade the pace of change may, in fact, have slightly accelerated. As the country urbanizes, and more Indians migrate to other parts of the country for education or for jobs, there is a steady delinking of caste from occupation, as well as of family from marriage. Young Indians are freer than before to follow a profession other than that followed by their father or grandfather. They are freer than before to choose a romantic partner other than one chosen for them by their father or grandfather. India remains a deeply hierarchical society. However, while hierarchy remains, the form and substance of this hierarchy is being increasingly challenged. In recent decades, the erstwhile Untouchables, now known as Dalits, have educated, agitated and organized themselves for social and political action. So have women, albeit in smaller numbers, and more episodically. The rising self-consciousness and self-assertion of these two historically disadvantaged groups has provoked an upper caste and patriarchal backlash, with a wave of attacks on Dalits in villages and on women in villages as well as in towns. Yet this backlash itself demonstrates the steady undermining of social hierarchies in independent India. Dalits and women are still exploited and suppressed, but they are arguably less exploited and suppressed than at any other time in India’s history. That Dalits and women now more actively stand up for their democratic rights has provoked anger and hostility among the upper caste men who have traditionally oppressed them. Dalits and women have made modest progress in recent years. On the other hand, two other social groups are perhaps more vulnerable than they were ten or twenty years ago. These are Muslims and tribals. The insecurity of India’s largest religious minority has increased with the rising tide of religious bigotry fuelled by the ruling party, the BJP. Tribals are even less represented in politics and the professions than Muslims, and economically worse off as well. In the heyday of state-led industrialization, tribals lost their lands, homes, forests and livelihoods to public sector dams, mines and factories; now they lose them to dams, mines and factories owned by private companies. One statistic says it all: while they are 8% of India’s population, tribals constitute a staggering 40% of those displaced by mega projects. Tribals are the principal victims of India’s economic liberalization. On the other side, this liberalization has benefited tens of millions of non-tribal Indians, by lifting them out of poverty, and generating better paying as well as more productive jobs. Of particular note is the widening social base of Indian entrepreneurship. Once, this sector was dominated by family firms run by mercantile castes. Now, farming castes produce successful entrepreneurs; as do elite Brahmins and subaltern Dalits, the first previously hostile to business, the latter previously excluded from it. The cities of southern and western India—Pune, Bengaluru, Hyderabad and the like—are abuzz with new businesses, large and small, innovative and risk-taking, founded by Indians of all ages and social backgrounds. The benefits of this entrepeneurial energy and vision percolate to other parts of the country, via taxes and subsidies, and remittances sent home by migrants. There remain substantial inequalities within and between states, and within cities such as Mumbai and Bengaluru. On the whole, however, the steady economic growth of the past decades has freed millions of Indians from destitution, and given them greater security and dignity. Is India more democratic than it was ten years ago? Or is it less democratic? The answer is neither one or the other, but perhaps both. While the quality of political democracy may have degraded in the past decade, social and economic democracy has somewhat deepened. The country remains where it was in 2007; a flawed and imperfect, so to say ‘fifty-fifty’ democracy. The Republic of India is by no means a Hindu Pakistan, but the violence in everyday life and the corrosion of our public institutions means that we are some distance short of being a South Asian Canada as well. India After Gandhi is the definitive history of modern India. This new updated edition, features extensive new material, to mark the seventieth anniversary of Indian independence.